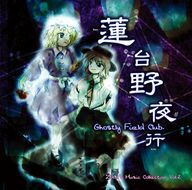 Night Trip to Rendaino ~ Ghostly Field Club (蓮台野夜行　～ Ghostly Field Club, Rendaino Yakou ~ Ghostly Field Club) is an official doujin album by Team Shanghai Alice released on 2003-12-30 (Comiket 65). It's part of "ZUN's Music Collection" and it's the second volume (vol.2). One autumn night, two young female mediums are looking for an imaginary world. An occult club from an age that knows not of Gensokyo. ↑ The Japanese word iku (or yuku) means "to go," but has a double meaning of "to pass away"/"pass on" when written as 逝く. "Dendera Fields" (デンデラ野, Denderano) is an actual location in Tono, Iwate Prefecture, said to have historically been a place where the elderly were abandoned. According to Kunio Yanagita's Tono Monogatari, the phrase Denderano arose as a Tohoku dialect variant of the name Rendaino (蓮台野). Another major graveyard called Rendaino exists in Kyoto; either or both could be the place referred to by the CD. ↑ It should be noted that this CD is this track's first appearance, not Imperishable Night. Imperishable Night was released on a later date, showing this track on its first trial release on 18th of April, 2004. Whether this track was originally planned to appear in Imperishable Night when this CD was first released is unknown. ↑ This is a remixed version of 魔法少女十字軍　～ Little Little Crusader, which was originally available for free on ZUN's old music page. On that page, it shows that the track was created on "20002/10/14", this is a typo and it should be "2002/10/14".